A shuttle bus makes the connection between the airport terminal and Sydenham rail station approximately 600m from the terminal building. 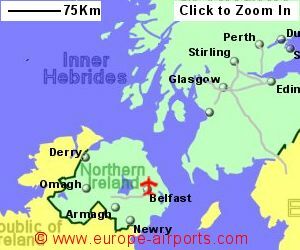 Trains run half hourly during the day and hourly at night to Belfast Central station at a cost of approximately 1.50 pounds. An Airlink bus service operates between the airport and the city centre every 20 minutes during the day at a cost of 2.20 pounds, and there is also a bus service to Londonderry. 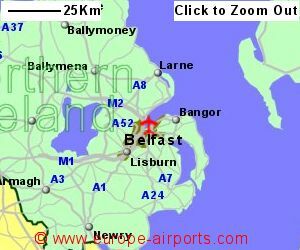 A taxi into Belfast is likely to cost 10 pounds. 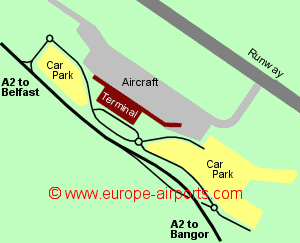 Short term parking is located immediately to the south of the terminal while the main car park is located 100m to the north. Facilities include 5 cafe/restaurants, 2 shops, ATM's (including one in the dapartures lounge providing Euros), bureau du change, 2 conference rooms, 2 meeting rooms and free unlimited WiFi Internet access. Passenger numbers totalled 2.5 million in 2017, a decrease of 4% from the previous year.